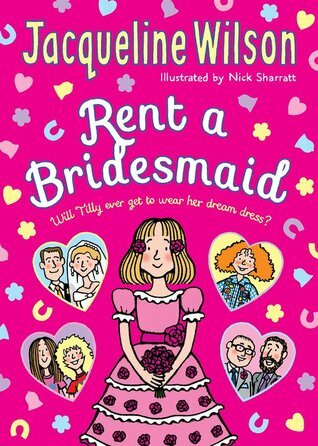 Tilly would love to be a bridesmaid, so when her best friend Matty gets the job, Tilly wants all the details. Tilly is aghast when she finds out that Matty thinks the whole thing's silly and can't stand the wedding. But since Tilly seems to think it is a big deal, Matty gifts Tilly with the dress after the wedding's over. Tilly is ecstatic and loves trying on the dress. The problem is that there's no occasion at which she can wear it. Dad's single (although Tilly holds out hope that he'll get back together with Mum) and no one else she knows seems to want to tie the knot. Then Matty suggests that Tilly rent herself out as a bridesmaid to weddings in need. 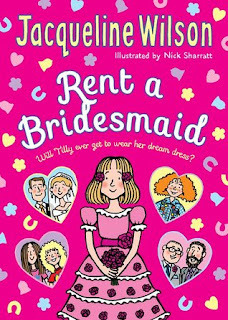 The idea seems daft, but takes off and before she knows it, Tilly's getting a chance to pursue her dreams of wearing a pretty dress and marching solemnly behind the bride! All of which is just the framework to pursue more serious issues like Tilly's struggle with her insecurity as she learns to share her friend Matty with another girl. And then there's the darker subject of Tilly's neglectful mother and Tilly's unrequited devotion for a woman who can't find love for her. But through it all, Tilly and her friends live in an idyllic world where children respect their elders and live safely with sensible caregivers. The story is cute and adorably British (while other Jacqueline Wilson books have been released in American editions, this one has not yet -- it came to me on a recommendation from an English friend). The constructive (and non-adversarial) relationships between children and grown-ups (not just with parents, but also with teachers and others) are refreshingly different from the more Disney-esque American notion of snarky kids and clueless adults. The relative innocence of the story is charming as well. None of which means that serious topics are avoided. The scene where Tilly finally comes to understand how shallow and neglectful her mother is is heartbreaking, but told in a way the reinforces to the reader that she still has people around her who love her. Overall, it's a lovely book for younger readers.